What Are the Benefits of Acai Berry Powder? Paul Gross (aka The Berry Doctor), a medical scientist with a Ph.D. in physiology, has been writing articles on the nutrition of berries, superfruits and antioxidants since 2005. He is author of a 2009 McGraw-Hill book on 20 whole food fruits, "Superfruits," and a science-based book on the wolfberry (goji). Açaí berry powder: Since we wouldn't want our strawberries powdered, let's not make a special deal out of açaí berry powder. When unfamiliar hyped products first enter the American marketplace, there is a period when their story, more than the product quality itself, stimulates sales. Remember New Coke, Betamax and ready-to-drink coffee--they came, they had little market impact, they disappeared--almost in a flash. Such is the case for açaí powder. Don't expect special benefits from açaí or any fruit powder over what you would gain from eating the whole food fruit. 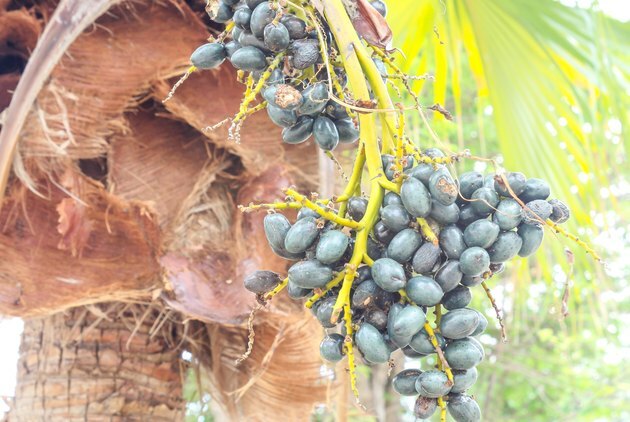 Açaí is a unique kind of berry that grows on palm trees in equatorial Brazil. Its powder has excellent content of some essential nutrients, but the powder sold as a health capsule or elixir is sour, oily, fibrous and unpleasant to use in a typical liquid beverage. It may be fine in smoothies, with other fruits and ingredients blended in, but you're still paying the pricey cost of açaí powder that cannot be practically used without other ingredients. The powder is produced from the original berry using special freeze-drying processes that make it expensive and an impractical purchase for most consumers. Although freeze-drying does destroy some of the nutrients and natural plant chemicals we prefer to have in fruits we consume, açaí powder is notably rich in dietary fiber, calcium, iron and vitamin E.
Then there are the claims that açaí powder helps you lose weight. Think about it this way: Oddly for a berry, açaí has exceptional oil content, a high-calorie source that would actually cause weight gain if sufficient amounts were consumed. So don't be fooled by marketing hype. It is far more pleasurable to eat nutrient-dense fresh fruits readily available on fruit stands, such as navel oranges, strawberries, mangoes, figs, red grapes, cherries and blueberries, than to digest powder. Think of the colors, crunchy freshness and natural nutrients that come in healthy whole foods, and how pleasant it is to feel the burst of fruit juice in your mouth. As nutritionists and physicians advise, it is more beneficial eating fresh fruits and vegetables than digesting exotic powders. As for the reputed and much hyped antioxidant power of açaí powder, this misleading information can now be laid to rest. Since 2008, the FDA has proclaimed the antioxidant "health benefits" promise from plant foods and capsules like açaí powder to be false. No science has proven the açaí antioxidant will benefit the human body. When fruits are consumed, the acid and enzyme environment of the stomach changes the ingested fruit chemicals, nullifying any antioxidant potential. It is now illegal for manufacturers to claim antioxidant health effects on product labels unless the product is loaded with antioxidant vitamins. The FDA-like scientific and regulatory authority in Europe, called EFSA, adopted the same policies in early 2010. Only vitamins A, C and E are scientifically confirmed dietary antioxidants, and the vitamins are best consumed from fresh fruits and vegetables.